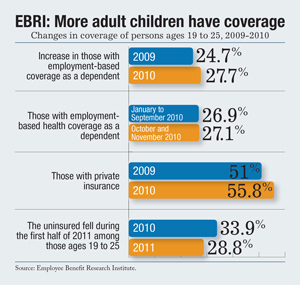 More adult children now have health insurance, thanks to a mandate of the Patient Protection and Affordable Care Act. The PPACA requires that group health plans and insurers make dependent coverage available for children until they turn 26, regardless of tax or student status, or dependent status as it relates to financial support. The mandate to offer coverage to adult children ages 19 to 25 took effect for policy years that began on or after Sept. 23, 2010, but since January is the beginning of the plan year for many employment-based health plans, many insurers adopted the requirements of the law before the effective date.